integration with either the Mobile Navigation module or Responsive Menus module for dropdown or mobile-friendly main menu. Sliders, custom fonts and other theme features do not come with this and you are encouraged to incorporate separate modules for each page feature that you wish. A news site is a good example of how to use this theme. A children's charity website is probably not a good fit for this theme. "This theme differentiates itself by its simplicity and structure. It does not incorporate a great list of features but rather embodies a frontend workflow. Many of the existing themes are bloated with features and overwrites. We do not want to rewrite output, just makes it easier to develop a theme in a structured way." - quote from the original developers. This theme has been manually tested successfully creating and viewing nodes and style guide in Backdrop with the Mobile Navigation, Webform and Responsive Menus modules. Color module integration is not enabled yet. It is another issue to do for this theme. NOTE -- this theme is somewhat stable but being developed state. If you have spare time and shared ideas on how to propel it forward coding cleanly and under the appropriate licenses, you are welcome to join in and offer advice or build it together. This theme works as is by just installing it. If it bothers you that we don't use the Libraries module, file an issue and we can try to change it. When official information on using third-party frameworks becomes known, this will follow it. The first big change we will make to this theme when we have time is to run this theme through an "un-css" cleaner and chop out some css (even core) to make this download faster. A major goal of this theme is to download your pages fast to the end user. Special thanks to https://www.drupal.org/u/frankbaele for this great work! This theme uses the PureCSS CSS toolkit from Yahoo! Special thanks to the developers at Yahoo! for this great work! This theme is not affiliated with Yahoo! or the PureCSS developers in any way. 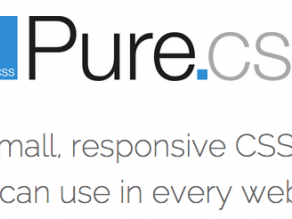 "Pure plays well with other libraries, including Bootstrap and jQuery. As a developer, you can pull in Pure as a foundational CSS framework, and then include specific Bootstrap or jQuery modules that your application may require." This theme can use the Bourbon/Neat SASS extensions from thoughtbot. This theme does not use the PureCSS grid by default. It uses the default layouts module until layouts in Backdrop become more defined. If you would like to use CSS instead of SASS, edit the css/style.css file to alter the appearence of your website. Place your custom CSS at the bottom of the file. The CSS folder contains the style.css file you should use, which is the file that gets loaded on every page. It gets overriden by SASS if you use SASS.